Wow, long time, no see, eh? Just when you thought I was gone for good, I'm finally back (and it's already summer! Sheesh!!). Sorry for such a long absence; I just hadn't felt like blogging in awhile, but now I do again and I'm back on the ball. So, on to one of my favorite subjects: beauty oils! Using oils for skin and hair care is all the rage these days. From argan oil for hair and skin to olive and castor oils for the oil cleaning method, to the ever ubiquitous coconut oil, which is extra popular in Paleo/Primal culture, oils are everywhere. I'm no stranger to oils, being the skin care adventurer that I am. Over the years, I've experimented with numerous oils, including olive, almond, hazelnut, rose hip, coconut (which actually dries my face out), castor, pomegranate, sea buckthorn, camellia, grapeseed, marula, argan, tamanu, sunflower, jojoba, and more. That's a lot of oils. But there is one that stands above the rest for me in terms of skin and hair improvement and that is extra virgin avocado oil. I've been using avocado oil as my facial and body moisturizer for awhile now and it has the magical ability to soften rough skin, deeply hydrate, refine skin texture, calm redness, plump fine lines, balance oiliness, and keep pores cleaner. In addition to using it to moisturize, a few months ago I also started using it to cleanse my skin at night and that's when I saw a pretty dramatic increase in benefits. I have combination skin that tends toward dehydration and clogged pores as well as irritation and mild redness. I no longer have to exfoliate my skin every other day- the cell turnover seems to have increased, and now my skin is super silky! The texture is much better than before, and the coarse areas are now baby-smooth. The redness is definitely reduced, while at the same time my cheeks have more color. Nice! My skin just looks better and healthier. 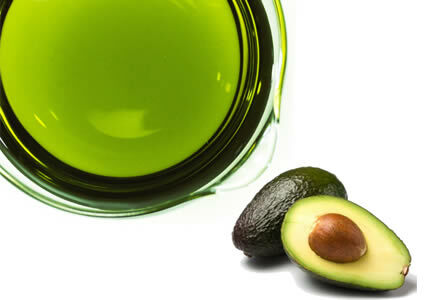 -Avocado oil is one of the more deeply penetrating oils. It gets down into the deeper epidermis layers and helps to fix moisture into the skin. This makes it great for plumping out fine lines and dealing with dehydrated skin (even oily skin can be dehydrated! ), as well as softening rough skin. Even though it feels thick, if used properly, it fully absorbs and doesn't leave an oily residue. The fatty acids are also similar to the skin's own sebum and are non-clogging. -It's rich in healing vitamins B, C, D, E, K and, especially, A (like a natural retinol alternative, increasing cell-turnover), as well as potassium, lecithin, and chlorophyll. -It has a high sterolin content. Sterolins are compounds which are anti-inflammatory and immune modulating. In the case of avocado oil, they can help heal sun damage and age spots, as well as inflammatory skin conditions like blemishes and eczema. -It has been shown in a study to increases the amount of soluble collagen in the skin and improve wound healing. This translates to better skin repair and anti-aging benefits, as well as better elasticity and thicker, more resilient skin. -It has a low level of UV protection (about an SPF of 6-8). Coupled with the high vitamin and sterolin content, it's definitely helpful for preventing sun damage (of course, use a non-toxic sunscreen if you're going to be out in the sun all day). -It penetrates the hair shaft better than most other oils due to its monounsaturated fat content and makes a great pre-wash conditioning treatment. I started getting compliments on my hair after I began using avocado oil to treat my hair! So, now that you know all about the wonders of avocado oil, here are some tips on how to use it so that you have a good experience with it. But first off, quality matters. I've used a number of brands and, by far, my favorite in terms of texture, smell, and performance is Olivado Extra Virgin from New Zealand. I find it to be less viscous than other brands of the virgin oil. You can also get cosmetic grade refined avocado oil, but my skin responds better to the dark green nutrient rich virgin oil. Chosen Foods makes an excellent naturally refined avocado oil that's neutral smelling (and tasting!) so you can still get the awesome hydrating qualities of avocado oil without smelling like an avocado. I just do the basic oil cleansing technique: I massage the oil into my skin for a minute (this feels so nice!) and then I remove it with a cotton ball. I then steam my face for about a minute with a hot wash cloth and wipe any remaining oil off (this is important because you're dealing with dirty oil!). I follow up with my toner. My skin usually feels comfortable and hydrated enough that I don't need to use more oil after cleansing. I always mix my facial oil with a little water or toner in my palm before massaging it into my face and neck. This makes a HUGE difference in how it absorbs, as well as helps to fix more water into your skin. Start with just a couple of drops of oil. You don't need a lot. This is super easy: I just massage a little into the bottom 2/3 of my dry hair (I don't soak my hair in it) and leave it in for a little while- often only 10 minutes while I make and drink my morning tea- and then I wash it out in the shower at the very end. I usually don't even need any conditioner. I use it 1-2 times/week. I just slather it on my body after showering, when my skin is still a little damp. Do I smell like an avocado? Totally! But I don't mind and the scent doesn't linger very long. I find it makes my skin so silky, helps with keratosis pilaris (due to the vitamin A content), and keeps my skin hydrated longer than other oils. Now, go have some fun with some avocado oil! P.S.- you can also use it to make salad dressing and mayo. I love Avocado. It really is a super food. It's loaded with vitamins and anti oxidants. It's great for the body, inside and out. Thanks for reassuring me that I can use extra virgin avocado oil on my face. I've been using it as a substitute for olive oil for the oil cleansing method. :) I think I'll try using it as a body moisturizer too! I bought some Olivada just a few weeks ago for my hair, then I shaved my hair all off. So instead I've been looking into using it for the OCM for my dry skin. Well, thanks to this blog post I'm for sure gonna start using it as my new after shower oil ( I was using coconut oil which I looooved because it made my skin glow and the glow lasted for hours but it went rancid on me :( So I'll be trying out the Olivado Avocado Oil this week. Got to use it before it goes bad. Would this work for a dry scalp, too? I saw you only put it on the lower 2/3 of your hair, but would an occasional scalp treatment help? Oh, sure! I think that's a great idea. I have a rather oily scalp, so that's why I generally use it only on the lower part of my hair. This is the only thing that works on my face. Before I wad using curel, not only is it full of chemicals but I would still wake up either a itchy face and that was using it twice a day. I make lotion bars with avocado and my face has Never been this hydrated. I use avocado oil straight on my body after showering. I like lotion bars for face.They have 1/3 avocado oil in them. I have heard from a friend of mine, who also praised Avocado oil, so I have started to use it as well. I am not a long term user, but I still noticed some minor changes on my face, my skin is a bit more smoother and you are right, the skin absorbs the avocado oil very quickly and it doesn't get sticky. Before I used also extra virgin olive oil and my skin never absorbed it properly it always make my skin shinny and oily, horrible, just horrible. Thanks for this informative article. I actually have the Chosen food brand in my pantry and am tempted to try it. Because it is refined, although naturally, do you still think their is a significant amount of benefits left or would it just be simply a moisturizing agent? Most of the benefits are from the fatty acids, so there are still lots of benefits in the refined. I'd guess that it's missing some minerals, vitamins, possibly sterols, and def. chlorophyll, though. howdy. what toner do you use? I use witch hazel mixed with essential oils tailored to my skin type. Thank you for this article. I had the same reaction with cocnut oil, it dried out my face and I had more wrinkles. I used the avocado oil on my face today and I already see the difference. Could you please inform me of the difference between oliv oil and avocado oil? From what I keep hearing, the two words seem to be interchangeable for what they do, lol Thank you. They're from two different plants, for one, and thus have a very different taste- olive oil ha a more acidic taste and avocado oil a more nutty one. They're both high in monounsaturated fat, so they are sometimes used interchangeably in cooking. However, avocado oil has a different nutrient profile than olive oil, including sterols that have anti-aging benefits for the skin. Avocado oil also penetrates the skin more effectively than olive oil, which is why I prefer it. Ah, I see. Thank you for the comparison! How do you compare avocado oil to sunflower oil? Sunflower oil doesn't seem to penetrate the skin and keep it moisturized and flake-free. What was your experience with sunflower oil? Any benefits, downsides? The form of vitamin A that causes increased sun damage is retinyl palmitate, so avocado oil is safe, especially considering that it contains a low level of natural SPF. Some people using avocado oil report sun damage fading over time, which also tells me that it doesn't increase sun damage. If you're very concerned about sun damage, I would assume that you're wearing SPF anyway, which negates retinol concerns. Which brand avocado oil for hair to buy? Thank you for this article! I started using avocado oil on my thumb nail that has been split down the middle for 10 years from fake nail tips taken off at a nail salon...Ouch! Soaking it in the avocado oil every night has healed it and I'm thankful for getting back to healthy beautiful nails. Love it on my dry skin face and body too! I think there is no other hair oil as good as the argan oil treatment from pro naturals! check it out girls!!! Hi, I am a stubborn girl who finally realized that all those commercial moisturizers are just too clogging for my sensitive skin, so I've decided to go more natural in my skincare regimen. I have started to use a raw honey mask at night and it feels so good. You have definitely got me interested about avocado oil and I'm going to be buying some of the olivado kind not only for my face but to cook with as well. I was wondering how much water you mixed with your avocado oil when putting it on your face? Also, is this too thick to apply under your eyes? I have heard that jojoba oil is really good for the under eye area. What do you suggest? Thanks for the awesome post really informative. Have a blessed day! It's not too thick for the under eye area if you dilute it and apply it to damp skin. I only need 1-2 drops of avocado oil for my face and I dilute it with 2 sprays of my toner or maybe about 4 drops of water (make sure to massage it in well). You want it all to sink in and not leave a thick later of oil on your skin. My skin isn't very fond of jojoba. It's a nice, light "dry" oil, but it doesn't sink as deep into the dermal layers. Have you tried mixing a little avocado oil with unrefined shea butter to make a facial moisturizer cream? I have sensitive skin and am trying this mix right now. So far, my face feels decent, but I am having a little bit of breakout on the cheeks. It is my hope this is the ugly before the beauty (as can happen when one changes their face cleansing methods) and it will work out fine. Any opinion? Thanks! What is the answer to this question? I would like to know also, since I, too, have oily skin. Thanks. Yes, avocado oil can be used on oily skin. I have oily/combo skin. Of course, everyone's skin may react differently to an oil so there are no guarantees. Just use a minimal amount mixed first with some toner or water in your palm. I will try what you have suggested. Thank you so much! wow today luckily I got avocado oil the same brand which ur using, and I had a doubt that after opening need to keep in refrigerator ,I am searching all websites to know that and luckily found u ,and cant wait to open it ,but I often travel and I want to put it in a small bottle and carry will oil go rancid? thank u soo much..
On the back of my bottle of avocado oil it says do not refrigerate. It doesn't need refrigeration, but it can be refrigerated- it will just get temporarily thick when cold, like olive oil does. Avocado oil is the best hands down! My favorite - I use it for cleansing my face to remove makeup & my skin is oh so soft afterwards! I have rosacea & it doesn't irritate my skin at all - very mild. I like to warm it up in microwave before using it on my face and definitely before I put it in my hair for a hot oil treatment. Also I use vitamin E oil excellent for skin with antioxidants which repair skin cells, prevents premature aging and regenerates skin cells overnight when used at bedtime. I've never tried it with water but I will tonight for a moisturizer. There are so many wonderful botanical oils for your skin among my favorites are carrot seed oil, cranberry seed oil, pomegranate seed oil and of course Brazilian rainforest oils Andiroba oil, Maracuja oil & buriti oil all very excellent but costly. What type of toner would be good for mature skin? It depends on your skin type, but probably something gentle without alcohol like rosewater or orange flower water. Hyaluronic acid can be a good ingredient if your skin tends to be dehydrated. I've been told I have porcelain skin. I'm planning a trip to the store today for avocado oil while there I'll pick up the rose or orange flower water. Thanks for the quick response and all the helpful tips! Do you use the oil cleansing method every night? because I read somewhere even the OCM should be done regularly but not to frequently. I tend to overdo it with skin care and wreck it. I am now trying to repair the damage I've done. I don't do it every night- I probably do it about 3-4 nights per week and I use my Clarisonic brush on the nights that I don't do oil cleansing. Are you referring to Caudalie's grape water toner? If so, the answer to both questions is yes. Avocado oil has a small amount of natural SPF, so it's slightly solar protective. Would you know about another good brand that you have tried of extra virgin avocado oil? The only other extra virgin brand I've tried was a Mexican brand I found at an international market. I don't remember the brand. Garden of Wisdom carries unrefined avocado oil in a one ounce size that you could try. I don't like it quite as much as Olivado because it's a bit thicker in texture, but it's still very moisturizing and beneficial. That was the brand I originally tried. I do not know is all stores carry it, but COSTCO in Schertz, TX has Chosen Foods 100% pure avocado oil. $11 for 1L. Its not Extra Virgin but still works well for me. Thanks a lot for your information!! I'd imagine that, being refined, they are a little more resistant to heat degradation. I really appreciate you sharing your knowledge of the avocado oil for cleansing the skin. I tried it today and it was wonderful! I just purchased an expensive cleansing oil and I'm sending it back. Thanks so much! Hi, Marsha, thanks for your kind words! Aftelier.com has some great perfume books and tutorial materials, and White Lotus Aromatics has perfume recipes listed on their site. Love your write up. Please can I mix avocado oil with grape seed oil and use as a day time moisturiser? I live in the tropics in Africa and have mature skin. If no, please recommend for me. That combination should be fine for dry skin. Try the kukui oil. I added it to my avacado, jojoba oil mix and I'm a happy camper. I use it for all the methods mentioned on your article. I remember reading that when using avocado oil to make homemade skincare products you can't heat it very high because it will go rancid quickly. I can't find the exactly temperature that it shouldn't go beyond. Do you know? can avocado oil be used on acne skin?? Thanks for sharing the useful info here. Keep up the good work. Do you ever mix the avocado oil with castor or any other oil when using it to cleanse, or just avocado oil? Also, on the days that you use your clarisonic, what cleanser do you use? If I feel I need a deep cleaning, then I do sometimes add castor oil, but I've found castor to be drying if I use it on a regular basis. On the nights I use my Clarisonic (about 3x/week), I use it with One Love Organics Vitamin B Enzyme Cleansing Oil, which emulsifies with warm water. For a day and night cleanser for someone who is begging to regain my skin from over exfoliation. I went through a super stressful time, hormonal imbalance and i have tried a ton of things with nothing really working 100%. I have maybe reduced sensitivity and blotchiness but now my skin looks old, wrinkly from this severe dehydration. What oils would you recommend for cleansing in the morning and AM and moisturizing with. I seem to not break out at all any more since this skin shift and my skin will take anything i put on it on the comedogenic scale. Hi, what color is the Olivado avocado oil? Is it dark green like the avocado oil shown in the picture on top of this page? Or is it more pale? Thank you! It's similar to the oil in the picture. I used my Costco Avocado Oil bcuz I didn't have lotion. glad I did. I didn't know the benefits. Thanks. i use avocado oil for my body after shower but i do not like the smell. is it okay to mix orange oil to it so that it smells better. can you recommend another kind of oil that is okay to mix with the avocado oil to make it smell better. thank you. You can add essential oils. Refined avocado oil like Chosen Foods brand doesn't have a smell. Nice post. Really helpful, so much that i went out and got a bottle of avocado oil (yay! *excited*). The only thing that i'm not sure about doing is mixing my toner with the oil. As i'm using diluted apple cider vinegar as a toner. I think the combination isn't right but please do let me know if i'm wrong. Looking forward for this to work for me :). I am using oils to moisturize my skin during the winter season but I find it very sticky! I am using lavender oil at the moment and just wondering if avocado oil is capable of hydrating during these very dry seasons minus the sticky feeling? I am breastfeeding my little one at the moment so I try to find products that are safe to be used while breastfeeding. Is this amazing avocado oil one of those? My skin feels dry and boring, I want to use moisturizing creams but they say it is not safe for breastfeeding moms like me! I dyed my hair a little over a month ago and it's a bit dry and I was wondering if Avocado Oil would be good for it. Without stripping the color out. If it is, would I use it as a hot oil treatment or mix it in with conditioner? Great blog! There is lots of good information, not only me but also everyone can understand it easily. Searching desperately for something/anything to soothe and moisten my skin, I happened upon this article. Now that it's winter and homes/offices use heaters, my face is extremely dry--I feel like it will crack any minute. I'm 60+ and started using coconut oil almost exclusively about 6 months ago. During the summer, I didn't notice my face drying out but now that it's winter, like you, I feel it is actually drying my skin. Reading this, I'm now convinced that I need to switch. It's at the top of my "got-to-buy-TODAY" list! I find that coconut oil dries my skin out, too! The oils with higher percentages of monounsaturated fats seem to work best for dehydrated skin. Marula is another oil I like for dry skin- it's a bit pricey so I only use it on my face. Great information you have provided about Avocado Oil. I've been doing this for a couple weeks and I LOVE how it makes my skin look and feel... For the most part. My chin has always been pimple prone (no idea why just this area! )and while the avocado oil has fixed the rest of my face, my chin is still an issue. Any suggestions???? Often, those stubborn chin breakouts are related to hormones, and occasionally to diet (I used to get cystic acne on my chin when I was eating gluten). This is why it doesn't always respond the same as the rest of your face. Looking into any hormonal imbalances would be worth a shot, and keeping a food diary can sometimes be useful for figuring out which foods might be triggering breakouts. wow today luckily I got avocado oil the same brand which ur using, and I had a doubt that after opening need to keep in refrigerator ,I am searching all websites to know that and luckily found u ,and cant wait to open it ,but I often travel and I want to put it in a small bottle and carry will oil go rancid? thank u soo much. That should be fine- it doesn't go rancid very fast, so I don't refrigerate it. I always fill up a small bottle to keep in my medicine cabinet so that it limits how often I have to open the bigger bottle. This may be a funny question but I have just started using a natural face serum, I apply it both morning and night but this particular product recommends I use a moisteriser about 10 minutes after applying it. I don't have a night cream so was wondering if I could use avocado oil instead. Do you think that would be overdoing it? And would the avocado oil seep in after having the serum on my face? Your advice would be much appreciated. Thanks. It should be fine to use avocado oil over your serum and it should absorb fine, unless your serum has a lot of silicone or dimethicone in it, which could potentially block the absorption of the oil. I'd still mix the oil with a spritz of toner or a few drops of water in the palm of your hand before applying. Just make sure to only use a few drops of oil. Hi. I've been doing the ocm with avocado oil only, for 3 nights. Though it hasn't been long, but the skin on my cheeks is starting to feel dry and rough to the touch and sometimes itches. After the second day of doing the ocm my cheeks were blushing as well. I'd never had dry skin before, my skin is more on the normal with slight oily t-zone. Do you think that I had over exfoliated or used a too hot wash cloth to steam my face or could it be an allergy? What should I do now , I had stopped ocm for 2 days already, should I moisturize with avocado oil? Your advice is much appreciated. Some people are allergic to avocado oil. I would stop using it completely and try a different oil like grapeseed and see how your skin reacts.